There are downsides to working with light, said Clayton Orehek. For one thing, people tend to look only at the glowing illumination instead of the whole sculpture. Mr. Orehek sifted through a workbench in his shop that was crammed with tools, sculptures, loose objects and ostrich eggs. Mr. Orehek found the electrical cord and plugged it in. A pair of glass “shoelaces” jumped to life and glowed with colored light. The shoelaces snaked from a pair of worn boots that were suspended upside-down atop a metal pole sitting on a wooden crate. Mr. Orehek was right. It was difficult to see anything but the shoelaces. The illuminated glass popped from the whimsical sculpture and drew the eye away from the time-battered objects to the carefree strands of red, blue and pink light. Another downside to working with light is neon’s association with commercial signs. The lights in Mr. Orehek’s sculptures aren’t florescent but are a close cousin. The technical differences allow Mr. Orehek to manipulate the light by hand so he can forge whatever shapes grab his fancy. Despite the downsides, neon lights are one way Mr. Orehek infuses his pieces with emotion. He uses the slender tubes of illuminated glass in the same way painters use oil or acrylic to create compositions. Strands of colored light can be used to create color fields or used as accent, he said. This technique can be seen in his kaleidoscopes which combine his interest in giving new life to mechanical forms with layers of light created by glowing lights. Using light in his assemblages of found objects is a way to infuse a contrast of fragility against sturdiness and as a nod to the ephemeral nature of light and the possibilities when illumination and glass combine and are executed well, he said. The combination of strength and fragility are also found in eggs, Mr. Orehek said. He likes incorporating the shells of eggs from ostriches and other fowls into his pieces. Eggs also represent potential and new life, something he hopes to bestow when using discarded objects in a new way. Working with neon light was natural for Mr. Orehek. 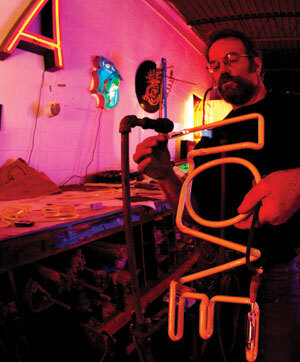 By day, he makes illuminated signs for businesses and theaters across the tri-state area. One of his projects was the recreation of the historic Sag Harbor movie theater sign. The art deco sign in blazing illuminated red attracts camera-snappers daily as a visual signature of the Hamptons village. Creating the lights is a physical process. 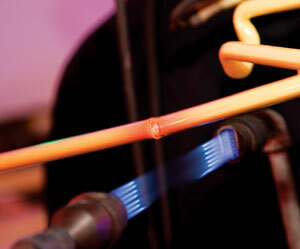 Single tubes of glass are melted and coaxed into shape by hand while heated over gas-powered flames. Mr. Orehek has several machines providing heat in his commercial workshop in North Babylon, where he also creates his sculptures. 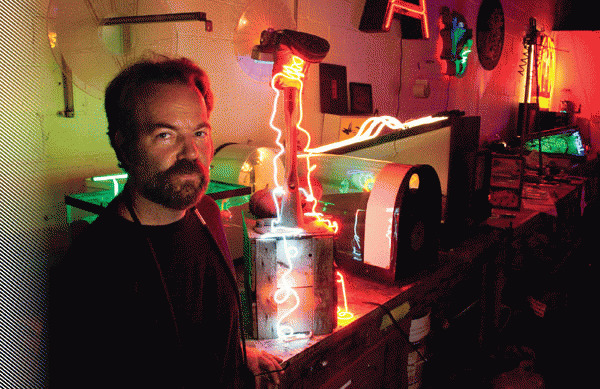 The light-making and assemblage-making ties into Mr. Orehek’s philosophy of art. For him, art is in the doing. 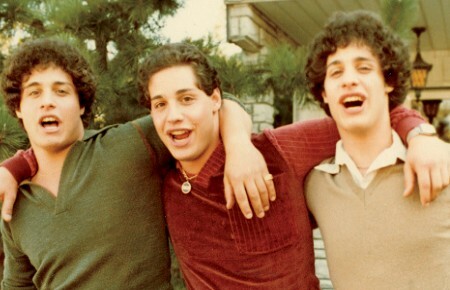 It’s the muse that bubbles, the creative chances taken and the avenues explored. 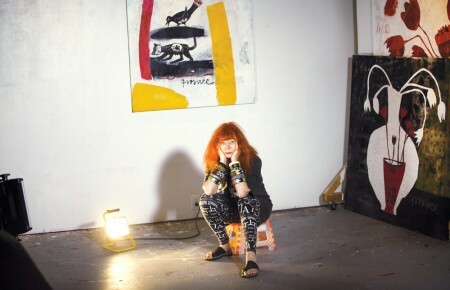 What’s left—whether a painting, sculpture, drawing or something else—is the physical manifestation of the effort. Mr. Orehek prefers not to call his sculptural pieces art. Not all of Mr. Orehek’s work incorporates light. Whether his pieces include light or not, all of his work uses objects that have meaning to him. 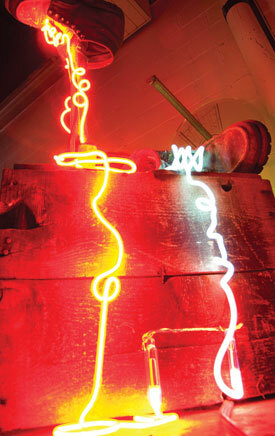 For instance, the work boots in the neon-laced sculpture were a favorite pair. A pocketbook fashioned from Volkswagen parts and lined with a flannel shirt was created for a girlfriend. The gift was fashioned from Mr. Orehek’s possessions he was using at the time of the pocketbook’s making. A running line through all of his work is his love of taking utilitarian items and paying homage to their form and design. Much beauty can be discovered in machinery parts, he said. Items from bygone eras hold sway with Mr. Orehek. Not due to nostalgia, but because of the careful designs and attention to detail that is often missing in functional items of today. A sense of humor and irony runs through almost everything he makes. In his office, Mr. Orehek transformed his phone into an assemblage. The base is an old-fashioned rotary phone. The receiver is an antique iron. When the phone rings, the person is forced to place an iron (a cold one) to their ear to accept the call. The phone has been part of exhibitions. A toaster from years ago was paired with two slabs of etched glass that reside where bread would be placed to turn into toast. Time’s swift passing and the way it plays into culture and attitudes is another concern. Some of Mr. Orehek’s work springs from clocks or incorporate the gears and parts that allow a clock to keep time. An art deco sensibility and penchance for designs that spring from function can also be seen in Mr. Orehek’s work. Mr. Orehek has exhibited at the 2009 Patchogue Biennial, The East End Arts Council Gallery, the Long Island Science Center in Riverhead, the Patchogue Theater for the Performing Arts and other places. Mr. Orehek does not have a website. For information, email offhandglass2003@nullyahoo.com.